it seems all over the press at the mo - Darcey Bussell has left Strictly Come Dancing, for her other commitments. I hadn't realised she had so many other commitments, apart from the RAD. She does a fair amount of coaching at the RB too of course. Maybe she’d like to do more of that, or just have a bit more down time. David Bintley is another .... perhaps he will replace her on Strictly ... now he's leaving Birmingham. That may sound far fetched ... but it's a relatively short stint ... good money ... and he would be free the rest of the time to build new dance works. Still - I would assume that they will want to replace her with another woman ... Quite right too. Oh, what a shame. Dd and I really enjoy watching Darcey Bussell on Strictly. She brings an air of elegance and calm authority (the audience rarely dares to “boo” her); gives constructive advice and useful corrections. From a selfish point of view, I hope they don't replace her with a ballet person/someone in whom I'm interested - I only started watching Strictly when DB became a judge, just out of curiosity, and then I found myself having to watch the darn thing every Saturday evening AND every Sunday evening for months on end! I too have other commitments!! (i.e. other things to watch on TV...). I think she's done a good job in showing that a ballet person can be down to earth, funny, nice, etc; but I'm not sure the show/having her on it has really done much for the promotion of ballet as an art form, except that I hope maybe a few Strictly viewers have gone on to watch live screenings she's also fronted. But then promoting ballet as an art form clearly isn't its remit. I don't mean this unkindly because it was a perfectly reasonable route for Bussell to take. But being on 'Strictly' has had the advantage of keeping her in the public eye and enabling her to pursue other projects in a way which would probably not have been possible without that regular TV exposure. Yes, and I hope that she continues to use that profile for pursuing projects like the recent programme about dance and mental health, which was excellent. I have heard/read somewhere that Arleen Phillips may be returning to the Show but this could be press speculation etc. id be shocked if that happened but who knows. I will miss Darcy too. But there is also an article claiming Cheryl ‘Call Me Cheryl’ Whatshername could become the new judge. The Arlene Phillips suggestion recurs every time a judge's place becomes available. I cannot see the BBC revisiting that one. 'Cheryl' please God no!!! I think we can be pretty safe that it won't be a white, middle aged man - sorry Anton, you're too popular. I can see Ore Oduba getting the gig. Lots of boxes ticked, but the BBC appears to promoting only women at the moment. I take it Fiona Bruce is too busy. Whoever they get, I hope it is someone with genuine credentials and experience in that style of dancing, rather than simply being a past winner or a well known personality vaguely connected to the world of dance. If there was a vote, then I'd really like to see Karen Hardy on the judging panel. Karen Hardy would be a very good suggestion but she might be too much competition for Shirley thingy. Whoever it is I really hope the slide from ballroom to more or less being shoved aside in favour of Latin is halted or even reversed. I’d think the BBC will look for someone younger to diversify the panel. Maybe Stacey Dooley as a highly popular past winner, though she might be too similar to Claudia Winkleman as a slightly “quirky” personality. Ore Oduba seems a fair guess. P-leese not the smug Ore Oduba. We need a dance expert and NOT another past winner. Alesha was too much for anybody. Could also live without Stacey Dooley. Didn't watch last season because I simply cannot bear the Tess/Winkleman combo, find Shirley so brash and I miss Brendan! Really sorry but hope it's NOT Stacey Dooley!! Even the runner up last year Faye from Steps would be better qualified than Stacey and anyway I find her quite false. perhaps someone from Musical Theatre? But a proper Dance Professional who has had some sort of career .....not a "TV personality" or past winner. Well, I am sure that would be highly entertaining to watch. I presume that the new judge will be female, to balance the sexes evenly. Here is my long shot. If the thinking is that it has to be a past participant then how about Debbie McGee? Plenty of experience in the dance world, articulate, and charming. And I am always in favour of any female who proves that ladies over a certain age can still look good and give the youngsters a run for their money. Having said that, it will undoubtedly be a young, glamorous female personality "to attract the younger audience." I am struggling to think of an obvious choice. Unfortunately, the only name that springs to mind begins with a K, and ends with "ardashian." I still think Karen Hardy would be a great judge; then there would be two former world champions on the jury and surely no-one could doubt their experience! My ideal scenario would be to replace Bruno with Karen, Anton or someone like Ian Waite and have three judges. That would negate a tie and the need for a Head Judge’s casting vote. I don’t mind Craig at all; he’s really toned down the unnecessary nastiness and actually gives good corrections (if you can hear him over the wretched booing). Bruno does my head in and I’d really like the new Judge to be an ex Ballroom and Latin Dancer. Yes Karen Hardy would seem to be okay......but don't feel that strongly in the end...every year I say that's it ....its the last year I am watching it. So perhaps this time it will be true!! 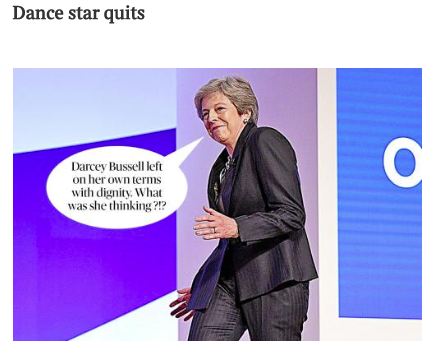 Ha ha not sure if dance moves are her thing judging by some of her recent public attempts. How very appropriate Ian Macmillan! I can't upload it, but there's a lovely picture of Theresa's Brexit extensions doing the rounds. With hair like that she'll never be allowed on Strictly!